This natural printing method draws out pigments from plants and flowers to make interesting patterns on cotton, linen and silk. Steaming plants and flowers into fabric is one approach. We have also developed a direct eco-spraying method with artisans from the NGO, Magan Sanghralaya, Samiti, in the village of Wardha western India. In this method, organic khadi, silk as well as wool can be readied for printing by dipping it in a solution made from harda powder. 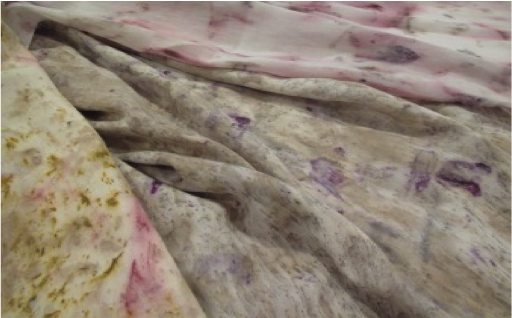 Natural dyes from plants and flowers are then sprayed onto moist fabric and allowed to spread. The fabric is then dried and boiled in a solution made from the Indian madder plant root and dhavri flowers for fixing the dye and giving a finished look. From our recent work with artisans in the village of Wardha, India. Eco-printed scarves are 44" W x 80" L and made from fine, translucent handwoven organic khadi. Our eco-printed, silk blend tunic comes in small, medium and large sizes. All of our eco-printed designs are based on 100% natural dyes from plants and flowers. Please contact us at info@contemporary-craft.com for more information.